Add the oil to a wok or large saucepan until half full. Place over low heat and add the dried chilli, ginger, garlic, star anise and peppercorns. Gently heat for between 20-60 minutes, depending on how much time you have. Once the oil is infused, remove the aromatics with a slotted spoon. Whilst the oil is infusing, place the Ferguson Ocean Jacket Cheeks onto a piece of paper town and pat dry. Place the Ocean Jacket Cheeks into a medium bowl and add the corn flour, sea salt, white pepper and five spice. Toss to coat the fish. Turn the heat to medium, and heat for a few minutes, until 180°C. To test if the oil is ready for frying, add one Ocean Jacket Cheek to the oil. The Ocean Jacket Cheek should become slightly golden within 2 minutes. Once the oil is ready, carefully place the Ocean Jacket Cheeks into the oil and cook for 2 minutes. Remove the fish from the oil and place onto paper towel to drain. 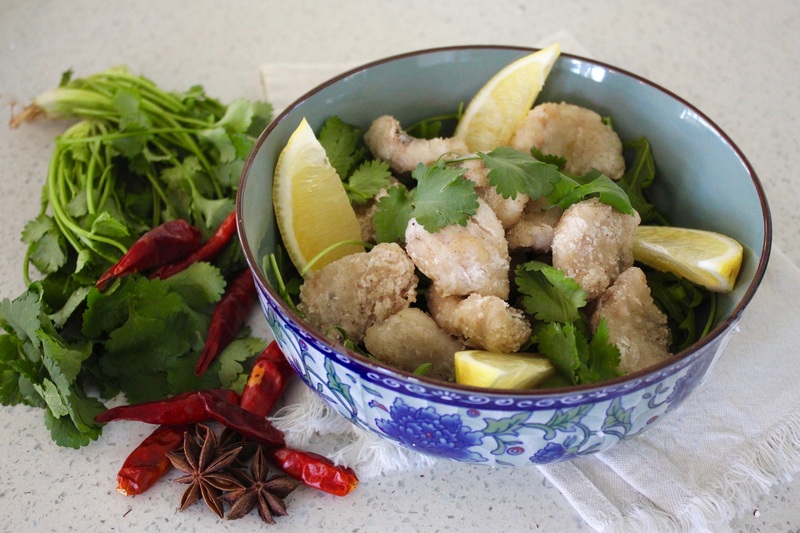 Place the fried Ocean Jacket Cheeks onto a serving platter with lemon wedges and coriander leaves. Serve immediately.